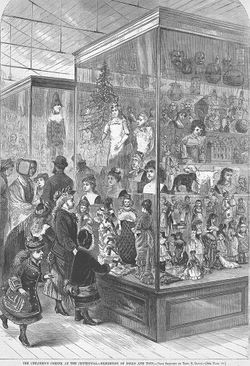 "The Children's Corner at the Centennial-Exhibition of Dolls and Toys", an engraving from the Centennial Exhibition 1876 Philadelphia Scrapbook. This is one of many, many resources linked to Jon Paul Sank's World's Fairs Page. Other World's Fair books, e.g., art books, photo books. YouTube and Internet Archive links. The portal is global in scope, but it does include material from Philadelphia, specifically, the Centennial Exposition (1876) and the Sesquicentennial (1926). Note: The above description was written for Wikidelphia by the portal's creator, Paul. This page was last edited on 31 January 2019, at 14:09.